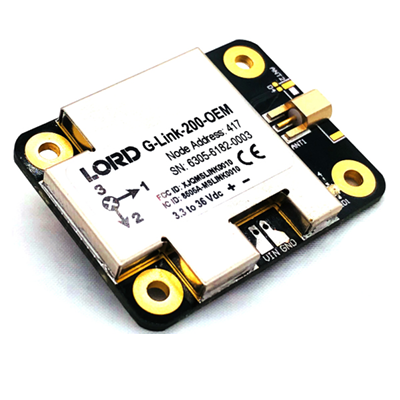 CARY, N.C. – LORD Sensing, MicroStrain — a global leader in sensing systems — launched a new embedded wireless vibration/shock solution. Designed for customers looking for a wireless sensor at a lower cost, the G-Link®-200-OEM sensor is small, light, easy to integrate and produces high-speed, lossless time-series wave form vibration data. Offering time synchronized wireless transmission of data, the sensor provides outputs for key performance indicators such as velocity (IPS), acceleration (RMS), acceleration (Pk-Pk), and crest factor. Users can measure vibration, impact events and acceleration at rates up to 4k samples per channel. The sensor, available with 8g or 40g accelerometer, is ideal for industrial equipment, machine health monitoring, off-highway condition monitoring, oil and gas equipment, structural health, as well as the aerospace and defense flight test markets. Current G-Link-200 customers will benefit as this embedded solution can help meet smaller size constraints. The new sensor has already been validated in computer chip manufacturing environments. “The G-Link-200-OEM sensor enables users to add a cost-effective, scalable wireless vibration monitoring to almost any product or application,” said Justin Bessette, wireless engineering manager for LORD Sensing.